In today’s episode of Access To Anyone, we’re reaching into the archives to replay one of our most popular episodes. If Tony Dottino had only accomplished one of the items on his resume, he’d be recognized as a bona fide success. He helped develop the Six Sigma system, which is now used in companies around the world. He developed the standards for the Malcolm Baldrige Award for President Ronald Reagan. More recently, he founded the USA Memory Championship, which was the subject of the bestselling book Moonwalking With Einstein. Today Tony talks to us about how to hack our memories, and why improving memory leads directly to more success and better relationships. 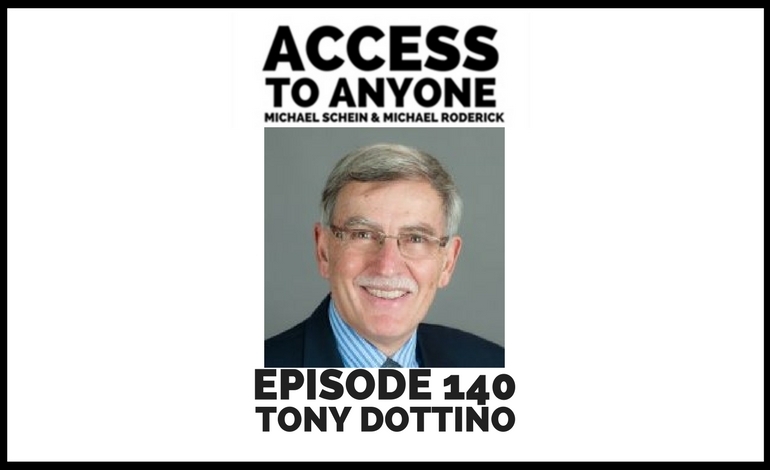 Tony Dottino is the founder and President of Dottino Consulting Group – a unique management-consulting firm that specializes in leadership development and the sustainable transfer of problem-solving skills to frontline workers. He has worked with industry giants including Johnson & Johnson, British Airways IBM, UTi Global, JP Morgan CHASE, Con Edison, IBM, the Department of Homeland Security, and multiple locations of the Florida Hospital System. When Tony recognized inefficiency and poor performance in areas like medical care, his interest expanded from helping organizations to improving the quality of people’s lives. Working with organizations like MIT, Tony has researched how people use their brain and memory more effectively to improve their business and personal lives. Tony is also the co-author of two books of his own – The BrainSmart Leader and the critically acclaimed Grass Roots Leaders – The BrainSmart Revolution in Business.